One day, scientists hope to engineer bacteria that produce and deliver drugs on demand. These bacteria would reside in the gut, synthesizing therapeutic drugs on-site and as needed. Josić, professor of mathematics, is involved in an interdisciplinary project with the aim of engineering therapeutic bacteria.To control the production of these drugs, patients would ingest a unique combination of molecules, such as edible sugars, that would turn synthesis on and off. These microbes, which could be engineered to sense the environment and respond accordingly, offer an efficient, low-cost alternative to synthesizing drugs in the lab. To make this idea reality, scientists need to figure out how to switch drug synthesis on and off in predictable ways. Depending on therapeutic requirements, these drugs might need to be synthesized slow or fast, or in low or high concentrations. 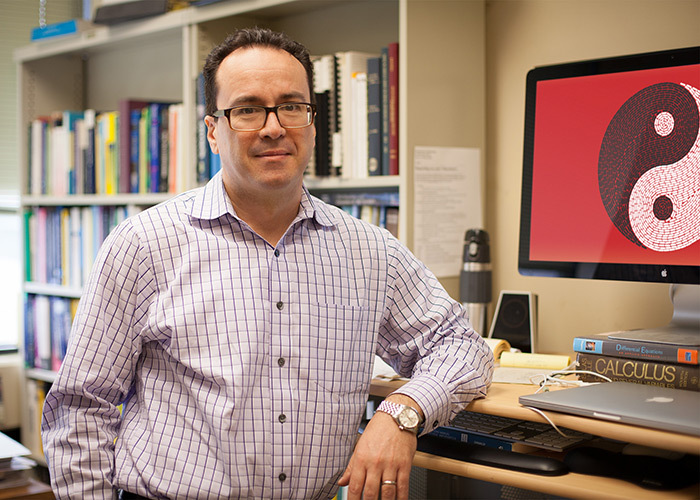 Krešimir Josić, a professor in the University of Houston’s Department of Mathematics, is involved in an interdisciplinary collaboration that aims to do just that. This project, headed by Matthew Bennett, associate professor of biosciences at Rice University, is funded by a recent four-year, $2 million grant from NIH’s National Institute of General Medical Sciences. From this grant, Josić’s research group received $485,000. Included in this grant are co-PI’s William Ott, UH professor of mathematics, and Liskin Swint-Kruse, associate professor at the University of Kansas. Engineering a predictable response involves constructing genetic circuits to respond as needed. Genetic circuits work by a signal triggering a cascade leading to protein production, providing on-site drug therapies. These signals, and responding elements, can modulate the timing and amplitude of the response. As a mathematician, Josić models the behavior of different genetic circuits, to predict how different components can create the necessary response. Each component of a genetic circuit can be engineered to have slightly different properties. Such properties include variations in the amount of signal needed to prompt a response, the amount of time for a circuit to respond, as well as the amount and rate at which a drug is synthesized. These variations will enable the construction of circuits that can respond in differing ways. Josić’s work streamlines this process, cutting down on the trial-and-error of constructing the necessary circuits. Synthetic bacteria residing in the gut need to predictably produce therapeutic drugs on demand, in spite of changing conditions. These includes changes in the spatial organization of these bacteria, as well as changes in the gut itself. All of these differences, some predictable, some not, need to be accounted for. “We want to create robust organisms that respond to a particular signal in a predictable way, regardless of distribution or perturbations,” Josić said.